Printable cursive alphabet letter chart with capital letters in A4 format with arrows. Suitable for kids ( for home and school use ). 1 letter chart with alphabet letters A to Z. This chart is available in PDF printable format. 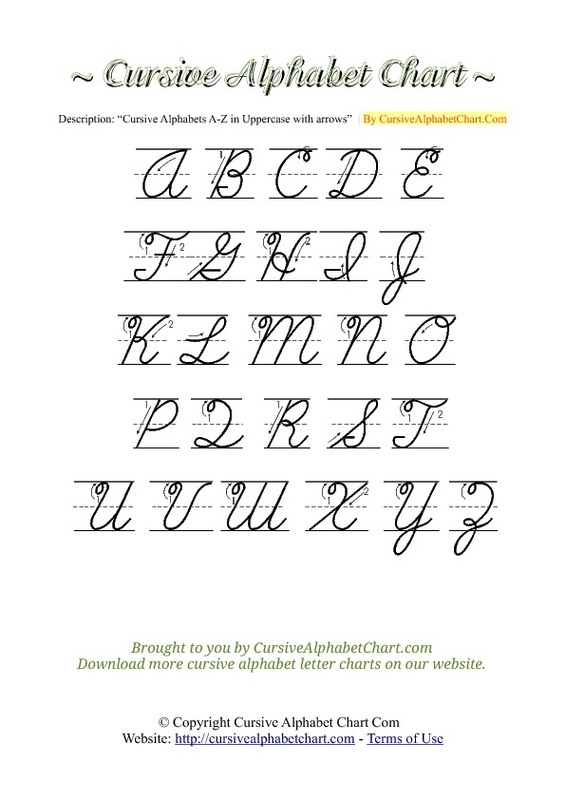 Download our free uppercase cursive letter chart with arrows below which contains all 26 letters of the alphabet in cursive form. Simply click the "Download" link below the thumbnail preview. A printable PDF page will open in a new window with the cursive alphabet arrow chart. You can print the cursive letter chart in PDF online, or choose to download and save the PDF document to a location on your computer. Free printable cursive letter chart with arrows suitable for kids. A to Z alphabets.